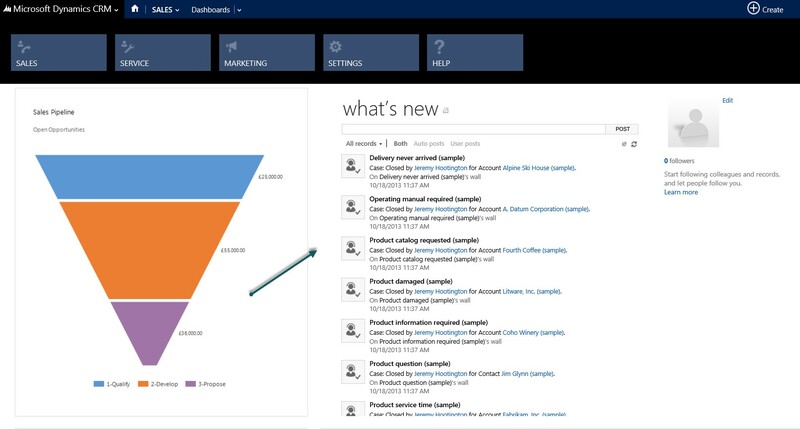 From as early as RU 12 on CRM 2011 a version of the new activity feeds were available, but in CRM 2013 this unique way of looking at customer interaction is embedded into the core customer screen for accounts contact and Leads, along with being available from the main Sales dashboard. This makes working with the current release of Microsoft CRM easier and stream lines some of the activity tracking and is definitely a step in the right direction in helping end users get to the right information quickly. The CRM 2013 release has taken on a new bold design which give the application a brand new look and feel and the Microsoft design team have obviously given a lot of thought about end users and easy navigation with the new top activity bar. Other activities can now be scheduled through the activity feed, and they include appointments, e-mails and even custom-created activities. As part of the attempt to make the software more streamlined, it is also now possible to stay on the same page once an activity has been saved, so other actions (such as marking it complete, deleting it, closing it and converting it to an opportunity or a case) can easily be taken. Users are of course able to go back to their activity feed at any time. The new software has also had new filters installed, which are ideal for helping to organise the different activity feeds. The in-progress filter is especially useful in that it displays the most relevant cases, such as those that aren't complete or those that haven't been closed. Essentially, the upgrades are focused more on user experience and streamlining the process, which are two key characteristics in any system. CRM is more than just adopting some software it is a methodology of putting your customer at the centre of everything your organisation does so invest and spend time on the whole process to gain the best results.